South Chennai is fastly developing compared to any other locations. The OMR is a crowd with IT employees crowd and the traffic is increasing day by day. Nowadays many people are shifting their interest to ecr living. From many years The ECR is meant for vacation spots and golden breeze. Many people have a dream to buy home in ecr and live peacefully. 1. Residing in a weekend vacation spot, families can go on a vacation and enjoy as and when they like. But as the prices in ecr are sky rocking, a 2BHK apartment is ranging from 1.5Crs and villa range from 2.5Cr the middle-class and above middle-people worried to buy. 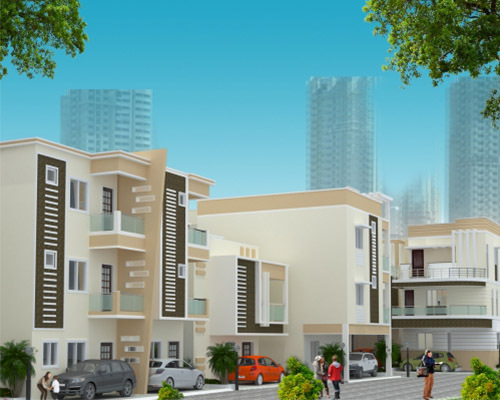 Apartments for sale in ECR are designed to meet the desires of small home seekers. These homes are part of a large community with easy access to shops, markets, hotels, banks, schools. Apart from this, there are parks, malls, theaters, gym, clubs and sports center to relax with kids and family members. The Nest njoy a landmark project in the world of affordable homes, which is a beautiful gated Community having Duplex Row Houseswith all the modern amenities, blossoming green landscape withadvanced architecture, a stylish art of clubhouse nestled with Gym,Swimming Pool, Party Hall, Children play area, etc., complete this An exquisite portrait of efficient living. NEST NJOY is an amazing gated community located near Mayajaal in ECR that fulfills all the desires of an urban home seeker. They are spacious, safe and secured apartments with the right kind of neighborhood for your family. The layout is perfect for both nuclear and large families. Check our apartments for sale in ECR to buy your dream house!